Round topped Stela, Limestone with traces of pigment, Luf-er-bak, mid 18th Dynasty. 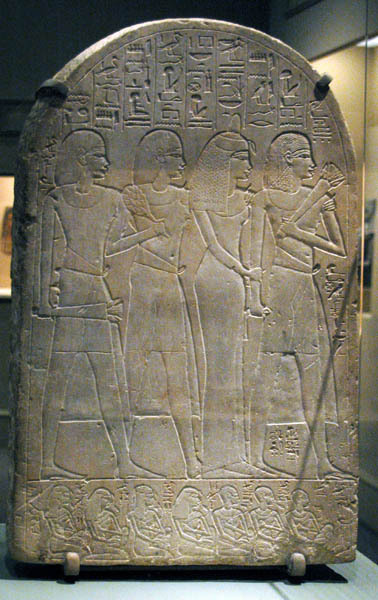 Luf-er-bak, a noble from the Egyptian capital city of Thebes, stands at the right accompanied by his wife and two sons. The men carry floral funerary offerings, while in the register below, seven relatives are seated at a funerary banquet, Luf-er-bak is identified by his name and titles inscribed above his head, as the "guardian of the storehouse of the Temple of Amun," while his wife is described as, " Nebet-iunet, mistress of the house"
The stela is carved in the extremely delicate, refined style of the mid 18th Dynasty, specifically that of the reign of Amenhotep III (ruled 1390-1352 BC) which is considered to mark the apex of Egyptian artistic production. Hallmarks of this tradition can be seen in the finely detailed facial features, the elongated proportions of the figures, and careful rendering of the transparent garments.